Back before Thanksgiving, I made a trip to the endocrinologist. I do this every three months. But this visit was different. 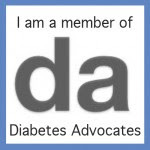 In my nineteen years of living with Type 1 Diabetes, I have only had two endocrinologists. When I was diagnosed at age 10, I started seeing a pediatric endo at my local children's hospital. Dr. C was my endo until he left the children's hospital after I graduated high school. It was time to find an adult endo. So I started seeing Dr. H. He was referred by a couple adult T1s my mom knew. Ten years later, he's still my endo. Why? He is always supportive, never judgmental. Even in the throughs of my binge eating and depression, when my A1c was more than a bit high, he only said, "We can do better." I actually felt pretty good going into my most recent appointment. I mean, I was nervous. I don't think I'll ever not be nervous about going to the endo. But since things have been looking up, I was confident that my A1c and Dexcom reports would reflect that. Dr. H comes in the room and we're chatting as we wait for my A1c results to come back. "How long have you been coming here?" he asked. "Ten years," I replied. "Can you believe it?" "Wow," he said. "It doesn't seem like that long." "You know, I've been practicing for 30 years. When you're a young doctor, you don't think about how your practice will grow and change with you. I have patients who've been with me the whole 30 years. They came as newly diagnosed Type 2s in their 50s and 60s. Now they're in their 80s and 90s, facing new and different challenges in their diabetes. It's really mind boggling." I sat there, almost speechless I was so moved at what Dr. H had said. I swallowed the lump in my throat and mustered: "Well, I think that's a tremendous testament to what a wonderful doctor you are." Dr. H just smiled. At that moment, the nurse came in with my A1c. Dr. H's smile got even bigger. He showed me the piece of paper. My jaw dropped. "Does that really say what I think it says?" I asked. "Yes it does!" he replied. "Way to go, kiddo!" YOU GUYS! My A1c dropped again. I am now officially at the best A1c of my life. Safely. Without too many lows. I still can't believe it. I know my A1c is just a number. It doesn't define me or my diabetes. But hot damn does it feel good to see tangible evidence that I'm not just feeling better, my health is better. I wanted to hug Dr. H. I wish I had. I could tell how proud of me he was. He knows about the binging and depression. My amazing CDE at his office is the one I sought help from in the first place. So thanks Dr. H for all your support. For never making me feel like a failure. And for helping me and so many others for so many years. Please don't retire any time soon. Excellent! I love this post. Well done. As I've said before, I'm proud of you, Jess! :] And, I'm happy you have the right kinds of support in the right places--when and where you need them. You're awesome--with, or without that stellar A1c. But, I'm happy you have the determination and support of a great team to help get you there and stay healthy :]. Jess, you (and your endo) rock! It sounds like you've got an endo who's following you for the long term, and who really likes to develop a relationship with his patients beyond a 5-minute office visit. I can't imagine what that's like... I've had 6 endos in my 31 years. Congratulations! And what good news about the A1c! I know you've been trying hard, and "best-ever" sure has a nice ring to it! You worked hard for that! And like everyone else, I'm so pleased for you. yep, it's just a number, but, man it feels sooo good when it reflects the hard work you've been putting into it!! YOU ARE AWESOME!!! I'm so proud of you!!! GREAT JOB!!! and your endo sounds AMAZING :) I just started with one and hope she's half as good! 5 endos in 9 5/6 years (2 months until the diaversary!). I am praying that this latest one comes back from maternity leave (unlike the previous one) because I really like her! Congrats, Jess!!!!! This is great, and I'm so proud of you! Your endo also sounds amazing, and like you I hope he doesn't retire anytime soon. Keep up the great work, my friend. It's an empowering feeling isn't it?! I'm happy for you. REALLY AM! Awesome! Way to go, Jess!